Winter can be hard on your sprinklers and other below-ground irrigation. If your irrigation systems didn’t receive winterization in the form of a manual drain, automatic drain, or a blowout, it could cause permanent damage. As we mentioned in a previous blog, “How To: Preparing Sprinklers for Winter,” the water left in the system can expand while it freezes, cause pipes to leak or completely break after the thaw. Between this and other winter hazards, you can find yourself come the thaw with a system that can no longer do its job. Today we’re looking at options for troubleshooting and replacing winter damaged irrigation, and when to call the experts in. There can be many issues that might cause your system to not work properly at any time of the year, but will often crop up after a long winter. Here are the most common issues and their causes, as well as quick solutions to first try before calling in the professionals. When you first turn your system on after the winter, there could be multiple causes if one or more sprinkler heads aren’t functioning right. Inspect the heads for cracking or damage that could have occurred due to water and ice expansion, snow removal, or the first mow after winter. If the head doesn’t seem damaged but doesn’t rise, it may be clogged. For both issues, you can simply dig around the base of the head to unscrew it. Then you can either replace the head or clean out any debris. 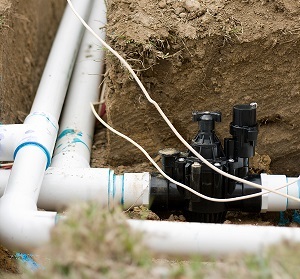 If a section of your irrigation system isn’t working, it may be an issue with the irrigation system’s wiring. Most of these systems divide the property into sections known as “zones.” If only one of these zones is having an issue, the fault may lie with the controller, the electrical system that toggles these zones. Make sure the device is properly plugged in, and if it is, try and check the voltage to make sure it meets the requirements in the owner’s manual. Ranges outside the proper voltage are a good indication that the controller may need replacement. If your system is suffering from low pressure, the chances are that you have a leak. First, inspect the heads to see if one or more have been damaged and if they flood the lawn with water. If all heads seem intact, let the system run and check for pooling or wet spots in the yard. If you find one, the chances are that a pipe has been damaged, usually due to a lack of winterization. Depending on the rate of the pooling and lack of pressure, you could be looking at a relatively minor leak or a completely crushed pipe. You’ll have to dig down into the lawn and repair or replace the pipe. If damaged pipes seem the culprit, it’s time to consult the professionals to access how much damage has been caused and how to best replace the pipes or system without destroying your lawn. If you’re in Massachusetts, contact Greener Horizon. We can help you with a free consultation of the problem, and provide you with your options for your particular system and its damage.